What do you think professors mean when we say audience? Why do you think it matters? Ethos is inferred, NOT possessed. Five strategies for persuading through character. Audience is quite possibly the most important thing to consider when writing an argument. You need to appeal to them, understand their problems, values, and beliefs, in order to convince them of your point of view. Who your audience is should influence how you present your argument. Who your audience is should influence how you present yourself. Determine what is important to your audience. What do they really care about? What do they value? We are going to free write for a few minutes. This is a great brainstorming technique to develop your topic. What topic are you considering? Write everything you know about the topic. Write for 5 minutes without stopping. Write sentences, bullet points, words, examples, etc. ; anything that comes to mind regarding your topic. Just keep writing. What is the primary purpose of the text? To entertain, inform, persuade, demonstrate knowledge, something else? Consider the topic. What point does it make? Who is the primary audience? How well is it adapted to the audience? Consider the author. What is her aim? Consider the medium and design. What is the genre of the text? Consider the occasion. Why was it created? Media/Design. How does the medium affect the tone and organization? Let’s apply these questions to the article we read for today. Take five minutes and answer the questions, individually or in groups of two. The Rhetorical Situation, or context for writing. The author has a purpose and is writing for an audience. They each affect one another. We previously talked about having a purpose for everything we do. Now we can see that purpose is also important when writing. Rhetoricians agree that all writing should begin first with a purpose. 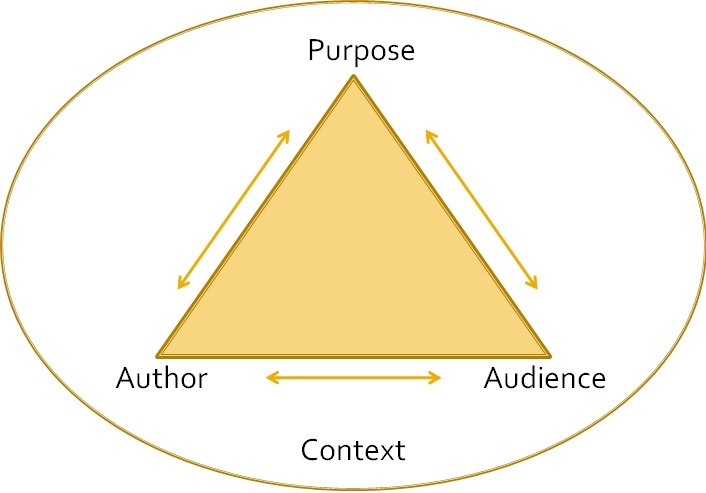 Author’s Purpose is the reason for the text. All good writing has a purpose. When we write anything, it can be for any number of reasons. When you read a story, try to figure out why the author wrote it. What motivated them to write it? What are they trying to achieve with it? What possible purpose can the author have? What purpose does the text have? These are the three main purposes a text can have, but these are not the only reasons. In college, we write to learn, to build knowledge, and to demonstrate learning. When you are given an assignment, figure out what your purpose is. What is the text supposed to convey? Good writing is purposeful. You have to know what you want to accomplish before you can figure out how to accomplish it and if you accomplished it. We can also think about writing within a conversation. You can write to summarize a conversation in order to understand it. You can write to enter a conversation, or to add to an existing one. What is our purpose in writing a rhetorical analysis? Why are we doing this? What is your purpose as an author in writing this rhetorical analysis? See the list above. Our purpose in writing a rhetorical analysis is to better understand the strategies authors/speakers use in order to persuade an audience. It’s important to analyze different rhetorical devices to help in our own writing. Knowing your audience is key because you have to present the write things in order to persuade your audience. Writing a rhetorical analysis is important because it give readers the opportunity to educate themselves, or add in their on opinions. When people say audience, I think they are referring to whoever the text, image is intended for. Who is meant to see that? The audience is important because it will determine the tone, type of language and rhetoric that will be used. For example, you would not speak to a child the same way you would an adult. The purpose of rhetorical analysis is to inform or persuade your audience of what the text or image you are writing about is trying to show. That way, your reader is able to see how you interpret it, or what you believe the author’s purpose is. I believe when a professor says audience it is about whoever you are writing to. It is important to know who you are writing to because you aren’t going to talk to your boss and friend the same way. One is going to be formal and the other is going to be informal. My topic is going to be a movie that is called “Dope.” The movie is about a group of three friends that are huge nerds and they are going to graduate soon. The main character out of the trio is Malcolm and he is an African American student who has a 4.0 GPA. Throughout the movie he is encountered with several distractions and obstacles along the way. He gets bullied and he is at a point in his life where he is obsessed with girls and starts selling drugs. He went to a 21 and up club illegally and that night changed his life and perspective forever. He is trying to get into Harvard, but the school he goes to is underfunded and underprivileged. The teachers don’t really care about the students as much. We are trying to analyze the purpose an author has for writing. Who is the audience and what is the message the author is trying to convey? Did the author do a good job with getting it across? My purpose is to make awareness of stereotyping people by their gender or race. When professors say audience I feel like they are trying to refer to a specific group they are speaking/referring to. Like stated above the purpose in writing a rhetorical analysis is to learn, build knowledge, and show what we learned. Rhetorical analysis’ are meant for one to look at the bigger picture that is trying to be shown and being able to decipher what the author is trying to show/ tell you. My purpose in writing this paper is to help me dig deeper, be able to comprehend the meaning of it more and do research in the ad I have chosen to write about. When professors say audience I think they mean they intended audience. For example, if you have an essay you have an audience of the reader and the professor who has to read and grade it. This audience factor matters because if you have something intended for the wrong audience that certain paper won’t work with another type of reader or professor. That’s why the saying know your audience is so popular. Our purpose in writing a rhetorical analysis is to become more aware on how to think more critically about a topic. My topic is a Kobe commercial and I’m learning about what the commercial means and what they’re trying to portray in the ad. My purpose in writing for my rhetorical analysis is to persuade and inform my audience about how special and how exhilarating the 2018 Toyota Camry can be. The goal is to exemplify to the audience that it is more than just a mid-sized vehicle and a family car. We are doing this to analyze certain text and advertisements to explain the ethos, pathos and logos of the subject. Audience refers to who a text is directed at or who ends up being exposed to a text. For example, a study may be published in a scholarly journal for mental health professionals like psychiatrists, therapists and psychologists. Those professionals are the intended audience. However, students doing research may also read the study and thus become a part of the text’s audience. It matters because a text is created with a particular audience in mind. This includes reasons of persuasion and how to speak to the audience based on their knowledge of the subject matter. Rhetorical analysis teaches us to analyze seemingly mundane subject matter critically. We are doing this to understand how writing is done strategically even if the text does not seem persuasive or biased. I believe the purpose of my rhetorical analysis will be to inform. Our purpose in writing a rhetorical analysis is to persuade, inform and entertain the audience of what’s going out or what’s being said through out the text. My purpose as an author is to send a message about the text that I am analyzing or somewhat in a way that will get everyone motivated or informed about what I’m talking about. When they say audience they mean the people who they are trying to get their point across. Also it’s the people who they want to persuade into thinking like them and making them view things a certain way. So the audience is who the article is meant for because there are different age groups. we are writing a rhetorical analysis because we want to be able to break down what we are explaining on either our video or our add we try to explain what is going on and we are trying to explain to the audience why want them to view the add in the way we see it. The topic I’m considering is going to be ads about PETA. PETA is a nonprofit organization that focus’s on people who eat meat. The word choice, color scheme and scenery really impact the female audience with the type of design and announcement they are trying to get across. I’m also considering the topic of drinking and driving and the ad that BMW launched about the results that drinking and driving may bring. The physical and permanent damage that is caused. why did they chose this picture? the comparison from car parts and prosthetic parts? The prices ? MEDICAL INSURANCE? CAR INSURANCE? Permanent damage, scenery, word choice, what the ad for the goal is? what is the ad trying to get across and how will it impact the consumers.? The purpose as an author to write this analysis is to mainly understand the negative effects that drunk driving may cause to a human being. Critically think and positioned myself as a bystander and not one to take a side. To critically understand that drunk driving really is dangerous with all the statics and sources that I will research and to better inform myself about this situation. My purpose as an author in writing a rhetorical analysis is to inform the reader about my topic and also my opinions on the topic. Also my purpose is to go into depth about the certain aspects of the text or ad or whatever it is that i am writing. For this specific rhetorical analysis i will be analyzing every aspect of my commercial and explaining it in the best way that i can to inform my college peers. In writing a rhetorical analysis our purpose is to better understand and dig deeper to an authors script. To look at the many aspects and views to a certain commercial, ad, artwork, etc. It is also important to understand the audience you are trying to get your message out to or inform an audience because you have to catch and keep their attention. My purpose in writing this rhetorical analysis is to persuade others to understand the message of the subject that I am trying to convey. I want my audience to see what is like to chase a goal and how having these goals can change an individual’s life. When a professor says audience they want their writers to be aware of who they are writing for to avoid sounded unclear or unaware of what they are speaking about. Knowing the subject of which you are writing is only having the job, you must know who will be reading it and either benefiting or upsetting the reader. The point in writing a rhetorical analysis is to express an understanding of something you find important and either agree or disagree and explain the idea and how you can relate to it. You try and find the bigger picture in what is being said and add to what is being said by your interpretation of the idea. The power in this speech can be felt and shows importance in what is being said and I feel that ideas like Chaplin’s need to be seen by a wider audience and people need to share these ideas because even if it was said in 1940 our world still sadly holds relevance today. I want people to understand just because someone was seen as a comedian movie star doesn’t mean he doesn’t have an opinion on the world around him. To inform and build knowledge is the main goal of Charlie Chaplin’s humanitarian speech in his first talking film: The Great Dictator and that needs to be known. When professors say audience, they are asking who the author is addressing their work to. Furthermore, the audience is directly correlated to the purpose, for the purpose of their work is to appeal to and persuade a certain group of people. Our purpose in writing a rhetorical analysis is to practice and execute a strategy that we use everyday. We are doing this in hopes of enhancing our critical thinking skills. My purpose as an author in writing this rhetorical analysis is to inform my peers on an important artwork that symbolizes inequities and racial injustices of the past that are still important within today’s society. I would also like to identify how this event exactly impacted us. My purpose on writing this rhetorical analysis is to make sure my audience understands my message. I want to persuade my audience on my agreement in my message I’m pursuing. I also want to entertain and inform at the same time for my audience. Most importantly I want to understand the message before I portray it to others. When professor say audience they mean who is the article meant for what type of people for instance, for an advertisement about chips and dips during the super bowl they are trying to sell to people that likes to watch football games and have big parties for the super bowl on a Sunday afternoon. My purpose of writing this rhetorical analyses is to break down what my topic is talking about and how it is being presented to me and how I see in a way that I could help others being said or sold with showing what is being said about the topic from other point of views and why it is being presented. What is your purpose as an author writing this rhetorical analysis? The main purpose of a rhetorical analysis is to inform or persuade an audience and most importantly to know who your audience is .My purpose as an author is to fulfil the main purpose of my rhetorical analysis. Making sure that it is clear and has a relatable audience. Ensuring that all my sources are credible and successfully support my writing.